Colorado striped bass with artichoke and fennel barigoule, confit tomatoes, chorizo and brown butter. What: WYLD, alpine-refined dining room featuring Colorado cuisine. Where: 0130 DAYBREAK RIDGE, Avon. Cost: Tapas and shared plates $13-$18; entrees $24-$54. 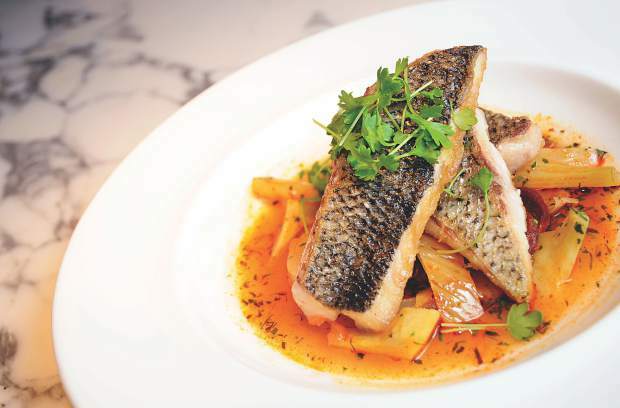 Signature dish: Colorado striped bass with artichoke and fennel barigoule, confit tomatoes, chorizo and brown butter. A refined palate doesn’t crave complicated flavors, but ingredient. WYLD captures “simple” and takes it to the next level. The restaurant projects a refined definition of Colorado cuisine, highlighting the best elements of the environment, from local ingredients to rustic and inspired combinations. The Ritz-Carlton, Bachelor Gulch restaurant offers a vast selection of mountain tapas so tables can indulge in trying multiple dishes. Start with a fire roasted cauliflower to share. It’s an impressive take on the vegetable, served as the whole head on a skillet, complemented by a flavor-rich lemon gremolata, buttermilk aioli and batula oil. For another hearty and fresh option, try the Alpine Cabbage. This warming tapa has braised cabbage over a bed of butternut squash velouté, along with shaved root vegetables, pressed apples and toasted pumpkin seeds. While pan seared scallops are a taste of the ocean, the hearty play on this dish feels very native. The buttery mollusks are placed on a spiced carrot puree with roasted cauliflower, toasted almonds, capers and golden raisins. For your entrée, selections from the “Butcher’s Block” portion of the menu are all about highlighting the meat. Try the 8-ounce beef filet, the elk rack or the Colorado lamb chop, and a side order or two can fill out the portion if your appetite is ready. Insider’s tip: both the Boursin mashed potatoes and the green bean amandine are perfect accompaniments. Fully plated entrées showcase creativity from the kitchen and wonderful options to enjoy. The Colorado striped bass is served with artichoke and fennel barigoule (a traditional braised dish), confit tomatoes, chorizo and brown butter, and WYLD’s wild boar comes with San Marzano tomatoes, Grana Padano cheese and roasted veal marrow. If you’re looking to drink your dessert, try the hot toddy-style libation from the talents of bartender Samantha Means. “Sammy’s Toddy” is made with cognac, spiced rum, hot water, a little bit of sweet and a sugar rim, garnished with a decorative star anise. Raise your glass and take a sip to seal in this lovely finale.